Nazareth, a modern city with Arab and Jewish populations, was a small, out of the way agricultural town when Jesus was a boy. Nazareth is not mentioned in the Old Testament and lies about equidistant from the Mediterranean Sea and the Sea of Galilee. Nazareth overlooks a valley of great importance and Jesus would have looked out over Roman soldiers who occupied the Valley of Armageddon (Megiddo) below his village. 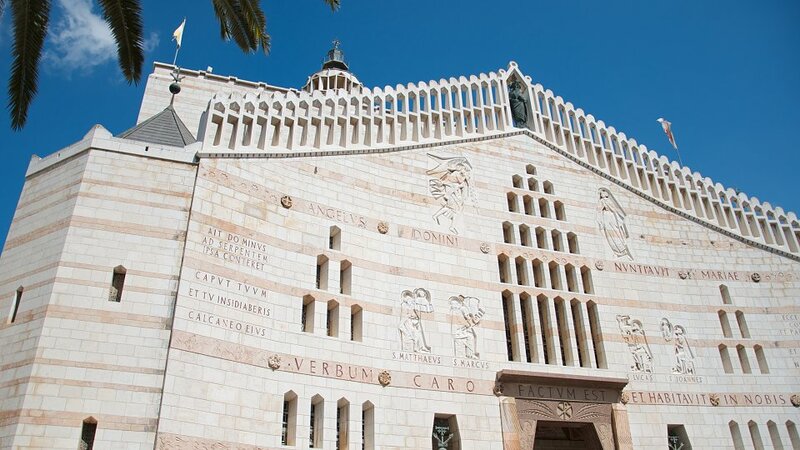 Today, the Church of the Annunciation and the Church of St. Mary, which sits atop the only water source in town, celebrate the town's connection to the birth of Jesus. At the edge of the modern city, the Mount of Precipice offers stunning views of the Valley of Armageddon and reminds one of the Luke 4 passage where Christ addressed the Nazarenes in their synagogue. 23: And he came and dwelt in a city called Nazareth: that it might be fulfilled which was spoken by the prophets, He shall be called a Nazarene. 9: And it came to pass in those days, that Jesus came from Nazareth of Galilee, and was baptized of John in Jordan. 24: Saying, Let us alone; what have we to do with thee, thou Jesus of Nazareth? art thou come to destroy us? I know thee who thou art, the Holy One of God. 25: And Jesus rebuked him, saying, Hold thy peace, and come out of him. 26: And when the unclean spirit had torn him, and cried with a loud voice, he came out of him. 27: To a virgin espoused to a man whose name was Joseph, of the house of David; and the virgin's name was Mary. 28: And the angel came in unto her, and said, Hail, thou that art highly favoured, the Lord is with thee: blessed art thou among women. 29: And when she saw him, she was troubled at his saying, and cast in her mind what manner of salutation this should be. 30: And the angel said unto her, Fear not, Mary: for thou hast found favour with God. 31: And, behold, thou shalt conceive in thy womb, and bring forth a son, and shalt call his name JESUS. 33: And he shall reign over the house of Jacob for ever; and of his kingdom there shall be no end. 34: Then said Mary unto the angel, How shall this be, seeing I know not a man? 35: And the angel answered and said unto her, The Holy Ghost shall come upon thee, and the power of the Highest shall overshadow thee: therefore also that holy thing which shall be born of thee shall be called the Son of God. 36: And, behold, thy cousin Elisabeth, she hath also conceived a son in her old age: and this is the sixth month with her, who was called barren. 37: For with God nothing shall be impossible. 38: And Mary said, Behold the handmaid of the Lord; be it unto me according to thy word. And the angel departed from her. 5: To be taxed with Mary his espoused wife, being great with child. 39: And when they had performed all things according to the law of the Lord, they returned into Galilee, to their own city Nazareth. 40: And the child grew, and waxed strong in spirit, filled with wisdom: and the grace of God was upon him. 14: And Jesus returned in the power of the Spirit into Galilee: and there went out a fame of him through all the region round about. 15: And he taught in their synagogues, being glorified of all. 16: And he came to Nazareth, where he had been brought up: and, as his custom was, he went into the synagogue on the sabbath day, and stood up for to read. 19: To preach the acceptable year of the Lord. 20: And he closed the book, and he gave it again to the minister, and sat down. And the eyes of all them that were in the synagogue were fastened on him. 21: And he began to say unto them, This day is this scripture fulfilled in your ears. 22: And all bare him witness, and wondered at the gracious words which proceeded out of his mouth. And they said, Is not this Joseph's son? 23: And he said unto them, Ye will surely say unto me this proverb, Physician, heal thyself: whatsoever we have heard done in Capernaum, do also here in thy country. 24: And he said, Verily I say unto you, No prophet is accepted in his own country. 26: But unto none of them was Elias sent, save unto Sarepta, a city of Sidon, unto a woman that was a widow. 27: And many lepers were in Israel in the time of Eliseus the prophet; and none of them was cleansed, saving Naaman the Syrian. 29: And rose up, and thrust him out of the city, and led him unto the brow of the hill whereon their city was built, that they might cast him down headlong. 31: And came down to Capernaum, a city of Galilee, and taught them on the sabbath days. 32: And they were astonished at his doctrine: for his word was with power. 34: Saying, Let us alone; what have we to do with thee, thou Jesus of Nazareth? art thou come to destroy us? I know thee who thou art; the Holy One of God. 35: And Jesus rebuked him, saying, Hold thy peace, and come out of him. And when the devil had thrown him in the midst, he came out of him, and hurt him not. 36: And they were all amazed, and spake among themselves, saying, What a word is this! for with authority and power he commandeth the unclean spirits, and they come out. 37: And the fame of him went out into every place of the country round about. 44: Now Philip was of Bethsaida, the city of Andrew and Peter. 45: Philip findeth Nathanael, and saith unto him, We have found him, of whom Moses in the law, and the prophets, did write, Jesus of Nazareth, the son of Joseph. 46: And Nathanael said unto him, Can there any good thing come out of Nazareth? Philip saith unto him, Come and see. 47: Jesus saw Nathanael coming to him, and saith of him, Behold an Israelite indeed, in whom is no guile! 48: Nathanael saith unto him, Whence knowest thou me? Jesus answered and said unto him, Before that Philip called thee, when thou wast under the fig tree, I saw thee. 1: Praise ye the LORD. I will praise the LORD with my whole heart, in the assembly of the upright, and in the congregation. 2: The works of the LORD are great, sought out of all them that have pleasure therein. 3: His work is honourable and glorious: and his righteousness endureth for ever. 4: He hath made his wonderful works to be remembered: the LORD is gracious and full of compassion. 5: He hath given meat unto them that fear him: he will ever be mindful of his covenant. 6: He hath shewed his people the power of his works, that he may give them the heritage of the heathen. 7: The works of his hands are verity and judgment; all his commandments are sure. 9: He sent redemption unto his people: he hath commanded his covenant for ever: holy and reverend is his name. 10: The fear of the LORD is the beginning of wisdom: a good understanding have all they that do his commandments: his praise endureth for ever. 1: Out of the depths have I cried unto thee, O LORD. 2: Lord, hear my voice: let thine ears be attentive to the voice of my supplications. 3: If thou, LORD, shouldest mark iniquities, O Lord, who shall stand? 4: But there is forgiveness with thee, that thou mayest be feared. 5: I wait for the LORD, my soul doth wait, and in his word do I hope. 6: My soul waiteth for the Lord more than they that watch for the morning: I say, more than they that watch for the morning. 7: Let Israel hope in the LORD: for with the LORD there is mercy, and with him is plenteous redemption. 8: And he shall redeem Israel from all his iniquities. 1: The wilderness and the solitary place shall be glad for them; and the desert shall rejoice, and blossom as the rose. 2: It shall blossom abundantly, and rejoice even with joy and singing: the glory of Lebanon shall be given unto it, the excellency of Carmel and Sharon, they shall see the glory of the LORD, and the excellency of our God. 3: Strengthen ye the weak hands, and confirm the feeble knees. 4: Say to them that are of a fearful heart, Be strong, fear not: behold, your God will come with vengeance, even God with a recompence; he will come and save you. 5: Then the eyes of the blind shall be opened, and the ears of the deaf shall be unstopped. 6: Then shall the lame man leap as an hart, and the tongue of the dumb sing: for in the wilderness shall waters break out, and streams in the desert. 7: And the parched ground shall become a pool, and the thirsty land springs of water: in the habitation of dragons, where each lay, shall be grass with reeds and rushes. 8: And an highway shall be there, and a way, and it shall be called The way of holiness; the unclean shall not pass over it; but it shall be for those: the wayfaring men, though fools, shall not err therein. 16: For God so loved the world, that he gave his only begotten Son, that whosoever believeth in him should not perish, but have everlasting life. 17: The God of this people of Israel chose our fathers, and exalted the people when they dwelt as strangers in the land of Egypt, and with an high arm brought he them out of it. 12: It was said unto her, The elder shall serve the younger. 13: As it is written, Jacob have I loved, but Esau have I hated. 14: What shall we say then? Is there unrighteousness with God? God forbid. 15: For he saith to Moses, I will have mercy on whom I will have mercy, and I will have compassion on whom I will have compassion. 16: So then it is not of him that willeth, nor of him that runneth, but of God that sheweth mercy. 5: Even so then at this present time also there is a remnant according to the election of grace. 6: And if by grace, then is it no more of works: otherwise grace is no more grace. But if it be of works, then is it no more grace: otherwise work is no more work. 5: To redeem them that were under the law, that we might receive the adoption of sons. 14: Who gave himself for us, that he might redeem us from all iniquity, and purify unto himself a peculiar people, zealous of good works. 15: These things speak, and exhort, and rebuke with all authority. Let no man despise thee. 10: But the God of all grace, who hath called us unto his eternal glory by Christ Jesus, after that ye have suffered a while, make you perfect, stablish, strengthen, settle you. 11: To him be glory and dominion for ever and ever. Amen.